Fittingly, this post about history was sparked by a rash of anniversaries. Today I mark five years on Twitter. March 3rd marked two years since I began my regular Skeptic History segment on Skepticality. And February 16th was three years since I began posting daily Skeptic History facts on Twitter and Facebook. All told, my skeptic history facts are available in several different locations and formats now. It occurred to me that someone coming across this project now might wonder how I put together this multimedia empire. Like many hobby projects, it evolved significantly over time – I certainly didn’t plan on it being what it is now. So I thought it might be interesting to recount the history of the project. It may be illustrative of how such projects start small, grow and mutate. In late 2008 I was toying around with some ideas for a new skeptic project. What’s the Harm was a success, but updating it was fairly mechanical and I was looking for a new challenge to go in a new direction. I’ve always been interested in trivia, and was reading all I could about skepticism at that time. The Skepchick Calendar was a popular skeptic project at that time and I was friends with several people who worked on it. So I started thinking about the idea of a calendar and historic dates. In hindsight I may have also had a vague memory of a non-skeptic publishing project I had done over two decades ago, back when I was in college. It had little to do with skepticism. To tell you the truth, I don’t recall thinking about my original historical calendar project at the time I was creating the skeptical one. It was, after all, over two decades ago. But while cleaning out a closet recently, I stumbled on a few unsold copies of it stuffed in a box. I was struck by the similarity to the current project, even if the media and subject matter is completely different. You can see the cover of it at right. Yup, I was a Trekkie. Big time. In the 1980s I was a college student and in my spare time I was involved in Star Trek fandom, including running a local fan club. 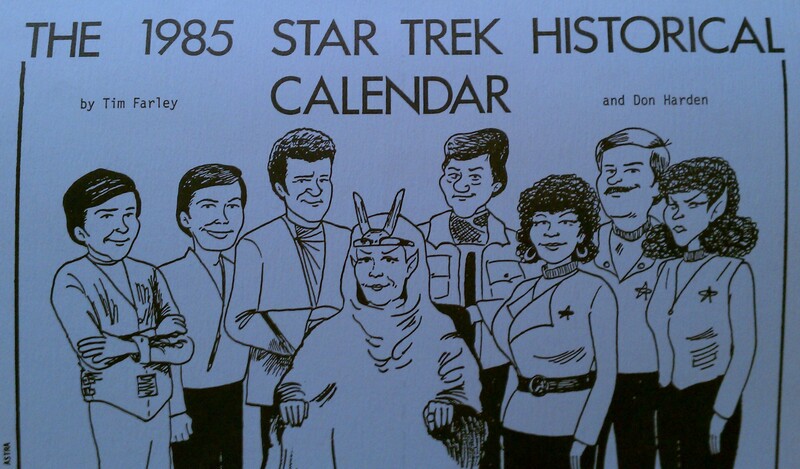 In order to raise money for the group, for a couple years we printed a commemorative calendar featuring the cartoons of Don Harden and historical dates relating to Star Trek on the calendar pages. The dates and the page layout were my work. In those pre-Internet days, researching the material for the calendar was quite tedious. It involved hundreds of note cards and many trips to the library. And creating the page layout was even more tedious, involving an IBM Selectric typewriter and literal cutting and pasting. Each daily fact had to be sliced from a typewritten sheet and glued into place on the appropriate date. (You may notice that some of the text is not perfectly aligned. We pulled some late nights doing all that paste-up). We did this for a couple years. Later (after I moved on from the group) it was continued by others. You can read more about it and see more pictures of the artwork and so on in this article at the fanlore wiki. Strangely enough, there are several connections between the content of the Star Trek calendar and the skeptic project. At least one you can find at that wiki site if you look carefully, and the others you may have to guess. I’ll reveal them at the end of this article. Lessons Learned: Sometimes old and seemingly unrelated projects can be the basis for new ones. So clearly I’ve been interested in historical trivia for a while. I decided to apply this interest to skepticism. Of course, I wasn’t the first to have the idea. 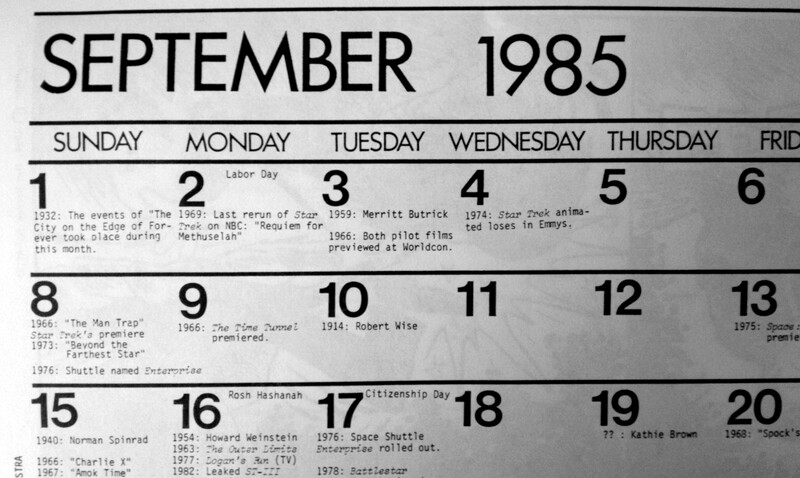 The aforementioned Skepchick calendar listed a few interesting dates on its pages, if I recall correctly. George Hrab has a regular Geologic Podcast segment called The History Chunk (which began in February 2007). And the long-running weekly Skeptic’s Guide to the Universe podcast usually includes a holiday or historical event that happened the day of the podcast at the top of the show (beginning in March 2007). But I felt there was still a niche here that wasn’t being filled. George of course was playing his segment for laughs. The SGU segment was (and still is) really more science than skepticism. Fine for a podcast that covers both, but I wanted to stick closer to skepticism. I knew I could dig deeper and not overlap with what the others were doing, by finding dates that were purely skeptical and were not being covered already. And so I set out to collect as many dates as possible that related as directly as possible to skepticism. I started clicking around Wikipedia, as one often does. Every time I found a birthday or an anniversary that related to skepticism, I added it to a file. Pretty soon I had a couple hundred interesting pieces of information in there. I noticed I was starting to get pretty good coverage over the entire year. Lessons Learned: It’s fine to build on something someone else is doing, as long as you find a way to bring a fresh angle to it and make it your own. Around that time (early 2009) skeptic activity on social media such as Twitter and Facebook was really starting to take off. I was (and am still) fairly active on Twitter, posting links to interesting news articles and skeptical blogs almost every day. On Twitter (as elsewhere online) it is very helpful to have consistent, regular posts. As I have a day job, a blog and other demands on my time, I sometimes can’t find interesting things to post every day. And nobody wants to know what I had for lunch, as the stereotypical complaint from Twitter non-users goes. I needed a good way to guarantee at least one interesting post every day. And thus I had the first outlet for my project: a “Today in Skeptic History” post. It was perfect: every day at the same time, I could post some interesting event or birthday that occurred that day and related to skepticism. I was finding plenty of stuff in my research that was not listed in the usual sources for “This Day In” features such as Wikipedia, The New York Times, Brainy History or Today in Science History. So I knew my posts would be unlikely to overlap what others were doing. At that time I didn’t anywhere close to full coverage of the calendar, so I couldn’t post every day. But it was a start. Lessons Learned: In the online world, its often not necessary (or even desirable) to wait until you’ve done exhaustive preparation. Just start getting something out there, and you’ll get good reactions that will help you refine it. At the beginning I wasn’t even sure what time of day to post. Knowing there are many skeptics in Australia and New Zealand, I wanted to post early enough in the day so it will still be the same calendar day there. (I live in the Eastern US, some 17 time zones behind New Zealand). So I tried 3 A.M. Eastern time. But that’s really way too early for the 60% of my followers who live in the U.S. – most of them are asleep. After some experimentation, I finally arrived at 9 A.M. Eastern U.S. time, which seems to work well for the majority of my Twitter followers (even if it is technically the next day for a few). I made sure to always include the date in the text of the post, to avoid any confusion. I quickly realized the best thing was to automate it. This was driven home for me when I went on one of the JREF cruises in March 2009, and I was off the net for days at a time. As businesses were starting to use Twitter for marketing, a number of services emerged that offered scheduled posting. At first I used one called TweetLater (now renamed SocialOomph). Automation was a godsend. It meant that I could plan out the daily posts a week or two in advance and post them simultaneously to both Twitter and Facebook. That way I knew if I got busy at work, or was out of Internet range for a few days there would be something interesting on my feed for followers to read. Lessons Learned: Keep adjusting what you are doing, and look for ways to make it better or easier. Of course, all through this time I kept researching to add more dates to the calendar. That was pretty relentless, because my goal was to have at least one item to post one very single day of the calendar (including Leap Day). It got fairly frustrating near the end of that quest when I had a handful of dates with nothing on them, but other dates had as many as eight or nine events. Random numbers are a harsh mistress. Thanks for the kind words about Skeptic History. Now someone find something better than Kent Hovind's birthday to post on Jan. 15, stat! Hive Mind: Need a better history for March 8th than "Max Gerson died". Ugh. What can you find? Must be SKEPTIC relevant, not just science. I also still maintain a crowdsourcing suggestion list here on the blog, and as you can see from the struck out items there we’ve managed to find a bunch of the items I needed. I still find really interesting dates from all kinds of sources, such as articles I’m reading or offhand remarks made by other skeptics online. And in researching this article, I found an item in the Star Trek calendar that actually needs to be added to Skeptic History! That’s another thing I’ll reveal at the end of the article. I’ve also gone old-school a few times, going to my local library to find old reference books. In November 2009 I was in Florida to observe the STS-129 Shuttle launch, and I took a side trip down to the JREF’s offices in Fort Lauderdale (about 3 hours away). The JREF library has hundreds of rare books and I was able to find a treasure trove of material for the database. Lesson Learned: Keep taking advantage of opportunities to improve. Mix old-fashioned (library) and state-of-the-art (crowd-sourcing) techniques as needed. With the right crowd, crowd-sourcing information does work. In early 2010 I started looking for other ways to make use of all this data I had collected. The one-per-day format meant that many of the dates I collected went unused. For example, February 12th is always going to be Darwin Day, which means the 5 other birthdays and one anniversary I’ve found that are also on February 12th will probably never be posted to my Twitter feed. (Although I have been known to occasionally post two Skeptic Histories in one day, I don’t do that very often). And of course, I knew all along that not all skeptics use Twitter or Facebook, so those folks would be missing my daily posts entirely. So I started looking for a new place to use all this information, that might reach more skeptics. The idea of a podcast had popped into my head, but I didn’t really want to start my own show. Mostly out of laziness, but also because I knew a podcast that was just about skeptic history would probably be a hard sell in a crowded skeptic podcast market. I figured it would be might work as a segment that could be added to an existing podcast. Two big skeptic podcasts (Skepticality and MonsterTalk) are produced by friends of mine right here in Atlanta, so I contacted the hosts to float the idea. Swoopy thought it was a great idea immediately. So that’s how the segment on Skepticality came about. It started in March 2010 with Skepticality #123, and I’ve done one for almost every episode since. I’ve even done two year-end wrapup segments that ended up being most of the episode both times. In the podcast segment I try to pull together a few dates from the current month that fit some theme, and tell a story around them. For instance, several proponents of the same pseudoscience that were born the same week, or some odd parallel between unrelated events. Sometimes I just tell the story of an obscure skeptic-related event that most people have not heard of, such as the Vaccine Revolt of 1904. Lessons Learned: Cultivate some skeptic friendships and allies. Sometimes they can provide new opportunities for you right in your own backyard. Find new ways to take advantage of material you already have on hand. I kept plugging away, adding to the data and posting it every day, and doing podcast segments every two weeks. More and more skeptics became aware of the project. In late 2010 and early 2011, the James Randi Educational Foundation approached me about turning the Skeptic History data into an iPhone App. They were planning to do a series of Smartphone apps as part of their digital outreach, and thought that Skeptic History would be a natural fit. The idea had occurred to me too, but although I am a software engineer by trade I just didn’t have time to build it. The JREF supplied their own programmer, removing that issue. They also supplied artwork and handled other aspects of getting it out there for me. After several months of effort the app was released in June of 2011, just in time for TAM9. At the same time I was then appointed a Research Fellow for JREF, and so I needed to blog on randi.org on a regular basis. I thought this might be yet another good venue for the material, since blog posts about history wouldn’t really fit with the theme of skeptools, but would work quite well over there. The one problem was coming up with new material from the same set of dates. I didn’t want to have to write twice as much material but I also didn’t want the JREF blog posts to “scoop” what I was doing for the podcast, since Derek & Swoopy had been so supportive. I discussed it with everyone involved, and quickly arrived at a fairly obvious compromise. Since I’ve been doing the Skepticality segments for more than a year, I was already making an effort to avoid reusing the same topics from last year on the podcast. Thus the year-old scripts would be perfect targets for recycling. After making sure Derek & Swoopy were ok with that (and making sure to give them credit and a link back to the original episode) I started posting in the fall of 2011. I simply take the scripts from the podcast segment from a year ago, edit them and update them as needed, break them into thematic pieces and post them as short blog posts. They aren’t always the most elaborate posts in the world, but usually I find an interesting angle to explore such as A Tale of Two Scientists or Astronomy vs. Astrology. Lessons Learned: Keep working with allies, and don’t be afraid to recycle old material. And finally, late in 2011 I got an email from Ben Radford, who was looking for material to fill out the back page of Skeptical Inquirer magazine, known as “The Last Laugh”. He figured my history items could be recast as interesting anniversaries to add to this page of trivia, puzzles and humor. I immediately agreed, and as of the November/December 2011 issue of Skeptical Inquirer, a handful of dates from my Skeptic History information appears on the last page of the issue as “Skeptical Anniversaries by Tim Farley”. Lessons Learned: There are always new ways to reuse material. Sometimes they just pop up out of the woodwork. The Skeptic History I posted Friday (Doris Stokes) was the 1,000th daily post! I hope you still enjoy them. I enjoy researching them. It’s over 1,076 posts as I write this. That includes some 300 year-on-year repeats, so over 700 distinct facts have been posted. There are about twice that many in the database, and it is still growing. One additional thing I do is keep the URLs of the each fact that I post on Twitter in a file on my computer, so I can keep calculate statistics like above and retrieve any old post at will. Thus if I wish to re-use the same fact from one, or two or three years ago, I can do it with a couple of clicks. (You might ask: why not just use Twitter search? It turns out it’s not very good at all at finding anything more than a week or two old. And simply scrolling backward through your feed is limited to your last 3,000 tweets). Lessons Learned: Work around the limitations of your tools. Keep backups of what you’re doing. I thought it would be interesting to skeptics to hear the details of how the project evolved. Like many projects it didn’t turn out the way I planned it – in fact, I never really planned it at all. I just started doing something that I thought was interesting and saw where it led. I continue to update the database and find new stuff to add nearly every week. That’s a good thing, because as this goes on I’ll need more material to write new stuff that doesn’t repeat each year. I don’t think I’ll be looking for any more venues at this point, I think I’ve got quite enough. Finally, one of the contributors to the Star Trek calendar was my college roommate Anson Kennedy, who was also a member of the Georgia Skeptics and ran an online archive for James Randi. March 26, 1859: French amateur astronomer Edmond Lescarbault claims to have discovered LeVerrier’s predicted planet Vulcan. (If you don’t understand why that’s relevant to skepticism, go read that Astronomy vs. Astrology essay at the JREF blog). Lessons Learned: Maybe I should have gotten into this skeptic thing earlier. This entry was posted in Skeptic History and tagged Geologic podcast, jref, Skepchick, skeptical inquirer, skepticality, Skeptics' Guide podcast on March 20, 2012 by Tim Farley. Very interesting to read how this all happened. Makes me think I should look at some of my abandoned projects again, maybe they can inspire me, maybe they can be reused. Thanks Tim!